You are here: Home / Featured / It’s #SmallBusinessSaturday! New Great Fine Horse Jewelry! It’s Small Business Saturday, a time for all the holiday shoppers out there to celebrate the independent, unique companies that provide a retail experience that’s markedly different than what you find at the mega retailers and big box stores. That’s what we’re always trying to do at Show Stable Artisans, and we thank you from the bottom of our heart for your loyal support! 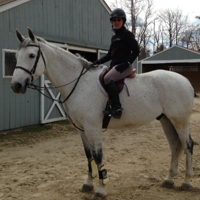 Cameo horse jewelry lovers, this one is for you! 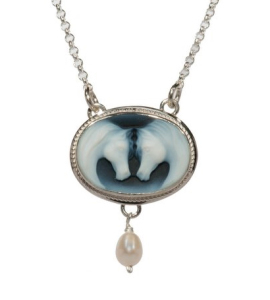 Check out this oval cameo horsehead necklace with a pearl drop. It’s gorgeously romantic, with a 18″ sterling silver chain. As you know, great horse cameo jewelry is hard to find. This piece featuring two equine portraits is extra special. A great gift for any cameo lover – or for yourself. Here’s a piece that’s definitely designed with the horsewoman in mind. A finely wrought sterling silver horse hoof charm dangles delicately from a fine sterling silver chain. When you think about how much of your life has been spent considering your horse from this unique viewpoint, you’ll find this equestrian charm to be absolutely essential. (Sorry, wee little sterling silver hoofpick not included! It does, however, come in our trademark gorgeous green gift box!) Made right her in the USA by our master jeweler. 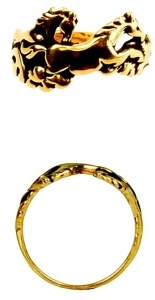 Finally, we’ve got to show you this gorgeous 14K Gold galloping horses ring. The picture just doesn’t do this ring justice – it’s an absolutely gorgeous rendering of two horses running as fast as they can, hooves and mane flying, in lush, tactile fine 14K gold. The low profile design makes this a very wearable ring. The amazing style and dynamic design make it the ring you’re going to want to put on every single day. We can’t wait to meet the bride who selects this gorgeous gold horse ring as their wedding band!